Scientists are warning that ocean acidification is impacting microorganisms in our ocean known as phytoplankton and, as they pay a key role in ocean habitats, any future loss or change in species numbers could impact marine life in a big way. Ocean acidification isn't always mentioned in conjunction with phytoplankton blooms, and the U.S. Government has been slow to link the two, but MIT researchers say acidification of our oceans could impact phytoplankton in a big way, and that will be bad news for our marine life. Publishing in the journal Nature Climate Change, the scientists say their research shows that ocean acidification -- where our oceans absorb gasses like carbon dioxide and sulphor dioxide that are released during the burning of fossil fuels -- will increase to such an extent that by 2100 several species of phytoplankton will die out, robbing several larger marine species of a vital food source, while other phytoplankton species will rapidly increase in number, threatening the delicate balance of marine habitats and even potentially threatening the bird populations that depend on marine life. 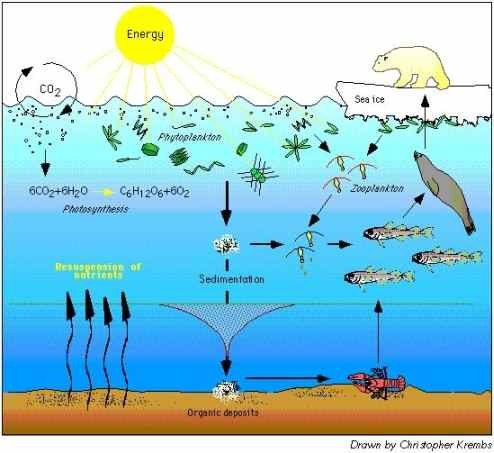 According to the National Ocean Service (NOAA), phytoplankton are organisms that function in much the same way as the plants we see around us. They contain chlorophyl and depend on sunlight. For that reason they tend to float close to the surface of the water where they can get as much sunlight as possible. They also take in nutrients like nitrates, phosphates and sulfur. In marine environments phytoplankton play a key role and are a food source for a number of species, from tiny animals like shrimp and snails, all the way up to jellyfish and even whales.